There is something intangibly important about giving birth to a baby vaginally and after having a c-section, the woman may choose to try a vaginal birth for her next child. 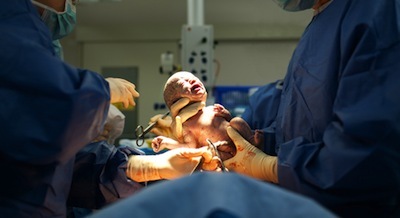 Cesarean deliveries are often unavoidable and are usually done when the baby is in the wrong position, labor is abnormal, or if the baby is in trouble. When a woman undergoes a cesarean section (c-section) birth, there is a bit of the birthing delight that is left out of the process. There is something intangibly important about giving birth to a baby vaginally and after having a c-section, the woman may choose to try a vaginal birth for her next child. When choosing a VBAC, there are very important aspects of the pregnancy and delivery that will need to be understood and following in order to keep both mom and baby happy. There are many reasons why a pregnancy ends in c-section. These can include high birth weight babies, emergencies deliveries and non-progressive labor. Depending on the reason for the previous C-section, the obstetrician in charge of the mother’s care during the following pregnancy may not approve of a VBAC. During a C-section, the uterus is cut in order to give the doctor the room he needs to remove the baby from the womb. The cut will heal, but the area of the scar will be stressed during any subsequent deliveries. When the uterus goes into labor, the muscles will contract with great strength in order to push the baby out of the womb and into the birthing canal. These muscle contraction can lead to uterine rupture; increasing the risk of complications with a VBAC. Without a doubt, no VBAC should ever be tried as an at home delivery. The complications surrounding a VBAC should only be undertaken with the proper access to medical equipment in case of the need for a repeat C-section. If the uterus were to rupture during birth, the mother may not be able to make it to the nearest hospital in time to get the care she needs. The most common reason why moms cannot safely try a VBAC is due to more than one previous C-section. Each time a c-section is performed, the uterus become weaker and weaker. After the 2nd c-section the chances of a successful VBAC, meaning one that is safe for both mom and baby, are minute. The obstetrician will more than likely suggest the third and all subsequent pregnancies be delivered by c-section. Without a doubt, there is an emotional bond that is created out of giving birth to baby vaginally. This by no means the mother of a child born by c-section is less of a mother. The idea is to end the pregnancy with a healthy mom and a healthy baby and if that requires a c-section, the end justifies the means. C-sections are more common today than ever before thanks to the widespread use of fertility drugs and multiple births. C-sections are a safe alternative for many women and the VBAC is not something every woman will be able to achieve. Birth is the process of baby entering the world outside of the womb. After the birth of a baby by C-section, the parents will need to talk to the obstetrician in charge of care about any options for a VBAC they may have.